Graduate assistant Aaron Pflugrad assists at spring practice on Thursday. TEMPE, Ariz. — Ask Arizona State coach Todd Graham about one of his assistant coaches and he’ll typically have a joke to make or a story to tell. But when it comes to Aaron Pflugrad, Graham apparently isn’t saying anything. "Oh lord," Graham says, laughing. "No comment. No comment. Prima donna — that’s all you’ve got to say." In truth, Graham has plenty to say about the former ASU receiver now on staff as an offensive graduate assistant. He turns half serious as he begins to rave about Pflugrad, sharing the nickname he’s given the 25-year-old. "I call him 2020," Graham said. "I tell him ‘Hopefully we can hang on to (Mike) Norvell until 2020, but then you need to be the guy.’ So that’s what we call him. He’s got a great future here." Graham isn’t naming Pflugrad his offensive coordinator in waiting or anything, but just the mention of him in the same breath as Norvell, himself a former offensive graduate assistant under Graham, who this offseason drew interest from Florida and Notre Dame, speaks volumes about how bright a future Graham and other coaches see for Pflugrad. "Pflugrad’s a guy I’ve identified that reminds me a lot of Coach Norvell," Graham said. "Very smart, very bright, coach’s kid. He’s a guy that we’re grooming to be a full time coach and a guy that is a Sun Devil. You talk about character, you talk about discipline — everything that we are about, that guy embodies it." Pflugrad, even as a graduate assistant, has spent more time around ASU than anyone else on Graham’s staff. His first exposure to the school came in 1995 when his father, Robin, joined Bruce Snyder’s staff as wide receivers coach and helped mold the 1996 team that went to ASU’s last Rose Bowl. After Snyder was dismissed at ASU, Robin Pflugrad spent five seasons at Washington State before becoming wide receivers coach at Oregon, where Aaron earned a scholarship as a receiver in 2007. 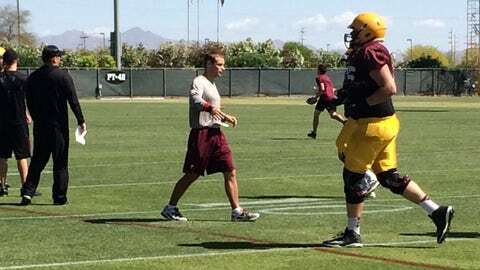 Pflugrad transferred to ASU in 2009 and became a staple of Dennis Erickson’s offense in 2010 and 2011. 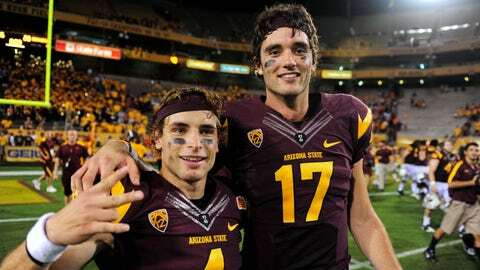 Aaron Pflugrad with quarterback Brock Osweiler during the 2011 season. Pflugrad went undrafted but got an opportunity to go to training camp with the Philadelphia Eagles. He was cut in late May but didn’t spend much time on the free agent market. The next day, Pflugrad was getting on a plane to head back to Arizona when he ran into Norvell, who had been in Philadelphia on a recruiting trip. Graham and Norvell had been around for Pflugrad’s last game as a Sun Devil, the 2011 Las Vegas Bowl. "It was kind of a funny deal," Pflugrad recalls. "He told me to come up to the office the next day, and that’s when Coach Graham offered me an opportunity." Graham offered Pflugrad a spot in ASU’s recruiting office and left enough flexibility that he could take an opportunity to keep playing football should it arise. Pflugrad ended up getting two NFL tryouts and played for about five weeks with the Omaha Nighthawks of the United Football League before the league folded in October 2012. When Pflugrad got back to ASU, it was time to make a choice: Hang on to the hope of playing professionally or dig in to a coaching career. "After I came back from Nebraska Coach Norvell kind of said ‘If you’re going to be the GA, then you have to make a decision,’" Pflugrad said. "What I told them was ‘if an NFL team calls I’ll take off, but if it’s something like the UFL or Canada, I’m ready to get into this coaching thing.’ "
Pflugrad started as a graduate assistant last season, helping receivers coach DelVaughn Alexander. During ASU’s preparation for the Holiday Bowl, Pflugrad got to coach the offensive scout team while the starters practiced on the opposite field. Kelly on Heisman: Why not me? "There couldn’t be a better place for me to come coach," Pflugrad said. "Yeah it’s where my dad coached, it’s my alma mater and I’m passionate about it, but also the people that I get to work with every day and develop under, I don’t think there could be a better situation in the entire country." Working under Graham and Norvell certainly seems as if it will look good on Pflugrad’s resume down the line. Of the four graduate assistants on last year’s staff, three have left for full-time coaching jobs, as did on-campus recruiting coordinator and graduate assistant Dan Lanning. Pflugrad had opportunities, too, but elected to stay for another year. "I really wanted to see this thing out, continue to develop," Pflugrad said. "I know we’re going to do big things this year, so I definitely wanted to stay on board." Graham takes pride in helping his young assistants, who work long hours for low pay, land full-time jobs but also keeps close tabs on them when they’re gone. He says he’d bring back Lanning and T.J. Rushing, who left in February to coach cornerbacks at Northern Arizona, in a heartbeat, which speaks to his preference to hire coaches he knows. "We want to grow ’em; Coach Norvell being the best example of that," Graham said. "We want to grow our own guys." Graham and Norvell are getting to watch Pflugrad grow right in front of them, and they like what they see. "He was a great Sun Devil, somebody that was very successful here as a player, and he brings that same energy and passion to coaching," Norvell said. "He truly cares about the kids that he gets the opportunity to work with." Pflugrad repeats the same lines Graham does about hard work and passion, he coaches players with a similar fiery demeanor, and he looks at the big picture beyond the position group. Pflugrad probably still has some time to put in before he gets a gig as a full-time coach — be it at ASU or elsewhere, though Graham is clearly keen on the idea of keeping Pflugrad in Tempe. But there’s no doubt between Norvell and Graham that Pflugrad will one day coach receivers and later call plays. Pflugrad’s aspirations match those expectations, though he’s aiming just a bit higher. "I’d love to be the head coach someday here at ASU," Pflugrad said. "But I understand I’ve got to just be in the moment, in the present. I’ve got to be the best GA I can be every day, whatever that entails on a daily basis."